Fruit Feelings is a fun and tasty way to explore feelings. This activity may be utilized in group counseling, individual counseling, and family counseling. Procedure: Before your session, draw different facial expressions depicting different emotions on an assortment of fruit (use fruit with skin). Let your students explore and play with the fruit. Most students jump right in and begin role-playing and creating stories about the fruit and the cause of their emotional state. 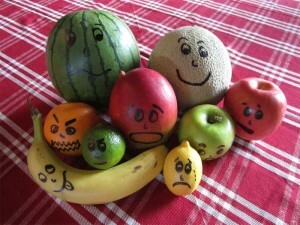 Have students guess the emotion of each piece of fruit. What signs or clues did the fruit give? Ask students to make up a story about the fruit. Ask students to role-play using the fruit. Act out each feeling. Ask students which fruit they are the most like and why? Ask students which piece of fruit is most like each of their family members.